Pilot screen from Life Chemicals Diversity Library. 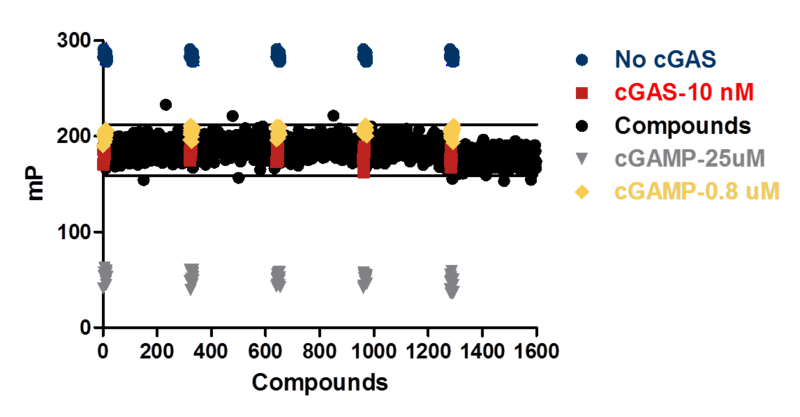 1600 compounds screened with 10 nM cGAS enzyme and 100 µM ATP, 100 µM GTP, and 62.5 nm interferon stimulatory DNA. 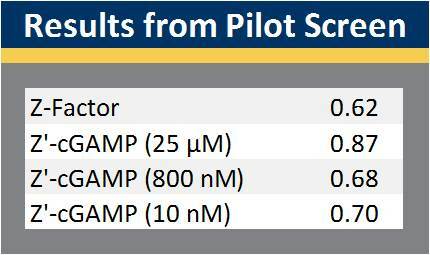 The enzyme reaction was 1 hour and plates were read on a BMG Pherastar® Plus plate reader. The instrument validation program is a collaborative effort with the major suppliers of multimode readers to insure that Transcreener® assays perform optimally on your specific instrument. Scientists at BellBrook and/or the instrument vendor have tested Transcreener reagents with each instrument to determine the optimal filters and settings for maximal assay performance. We provide you with application notes with all of the important details, so you can be confident of success using Transcreener assays on the instrument of your choice. * For custom or bulk orders (over 100,000 wells) please contact us (info@bellbrooklabs.com) for a quote.